Sometimes I look back on my single days so fondly. Like, what did I do with all of my free time? Oh yeah, I wandered around my apartment, wearing a cushy blanket and eating Chef Boyardee Spaghetti and Meatballs and eating Famous Amos cookies, and watching seasons of Gilmore Girls on DVD and I read Nicholas Sparks books. The truth is, those days weren't really all that great. The other day, I had to go to Target and spend $93.00 on things like allergy medicine, and medical supplies and ziploc bags and I had to just walk by all of the fun stuff. Target is evil, because they make you pass the cute stuff to get to the necessary stuff. I did not buy any of the following three things that wanted me to buy them. 1. The Choose Love/Be Amazing/Choose Happiness/Be Peaceful/Feel Beautiful candles. I think these candles smell so good, plus I'm such a sucker for cute packaging. But, nothing was on clearance, so I walked away. 2. 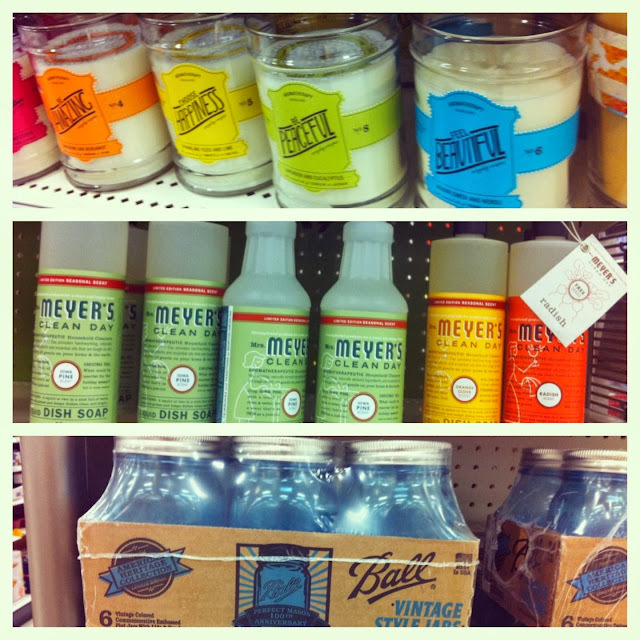 New scents of Mrs. Meyers Clean Day. I'm addicted to this stuff, but I usually stock up around Earth Day, when the coupons are awesome. 3. Random blue Ball Vintage Style Mason Jars. Pinterest pretty much exploded in my brain as I walked by, and I thought of like 47 cute things I could create in/with these jars. I actually left Target the other day feeling kind of down. We had a very tough Summer, financially. And things are finally getting better, thank the Lord! But, I can't bring myself to spend money on things we just don't need. I wish I just didn't want stuff! It would be so much easier. I wish if I had an extra $30, I wanted to spend it on something noble like feeding hungry kids or giving so they can have clean water, or saving those sad, slow motion dogs in those Sarah McLachlan commercials, and I do want to save those dogs and feed the children. But I also want all this cute Target crap that I don't need. Oh well. I'm proud of myself for walking away. Because I'm a grown up now, and I have to make wise choices with the money that we're blessed with. I miss the rush of shopping, but I have learned to get a little rush out of saving money instead of spending it. Saturday, I went to Sam's Club thanks to my new membership (thanks, Mom!) and I'm so excited to save money by shopping there again. Also, I realized that the Jiffy Lube Groupon is back, if you live in Hampton Roads, this is a good one and I'm always so happy when it coincides with when our vehicles are due for service. And, I found out that emeals is running a Cyber Week special, so you can get 30% off their meal plans. This is awesome for us, because I loved doing the Fresh20 meal plan, but we stopped doing that when we started eating Paleo, and having to plan my own menu each week is just too stressful and I usually fail and end up at a drive thru or ordering food through an app or standing in line every Thursday at Chipotle, and that's not cool. I hope those links help you if you're in a similar situation. I've also found that pinning things I want on Pinterest is a fun window-shopping type experience that is generally free.